NEWARK, N.J. – The same mistakes that led to an epic collapse continue to haunt the Buffalo Sabres. They struggle when playing away from KeyBank Center, fail to clear traffic from in front of their goalie and allow too many quality scoring chances. Some bad luck also has followed them since their 10-game winning streak. 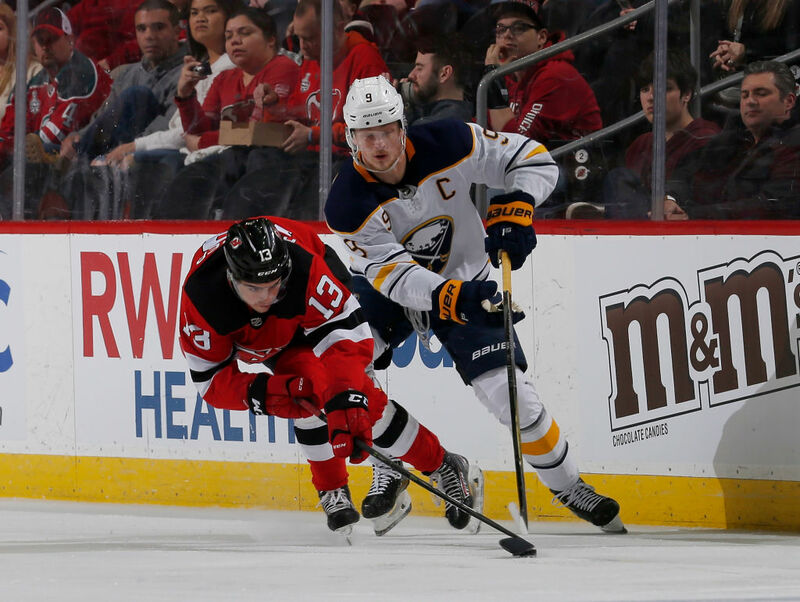 Sam Reinhart appeared to tie the score with 13:36 remaining in regulation, only to have his goal overturned because of goaltender interference, and the New Jersey Devils held on for a 3-1 win Monday night in Prudential Center. The Sabres (31-35-9) have lost 16 of their last 19 games, including 10 of their last 11, and own the league's third-worst road record (11-22-5). They are 12th in the Eastern Conference and increasing their odds in the NHL draft lottery. Their penalty kill allowed two power-play goals while they failed to score on the man advantage. Pavel Zacha scored the go-ahead power-play goal with 15:30 remaining in regulation when Linus Ullmark was screened, and the Devils broke the scoreless tie with Blake Coleman's first-period goal. Miles Wood added an empty-net goal with 1:25 remaining in regulation. New Jersey (29-39-9) has the third-fewest points in the conference and had lost 10 of its previous 13 games. Reinhart scored his 20th goal of the season in the first period, and it appeared he scored his second until it was nullified because replay review determined that Evan Rodrigues prevented Cory Schneider from attempting to make a save. Ullmark made 18 saves while making his first start in four games, and the Sabres finished with 46 shots on goal. Opening salvo: The Devils needed only 29 seconds into their first power play to take the lead. With Rasmus Dahlin in the penalty box for holding, Coleman collected a pass in the right corner and skated, untouched, toward the front of the net. Neither Marco Scandella nor Rasmus Ristolainen challenged him, and the shot beat Ullmark for a 1-0 lead 1:55 into the game. Half-ice shot: Dahlin forced a turnover near center ice, and the puck went to Reinhart, whose shot from inches behind the red line took an awkward bounce over Schneider's leg pad and into the net to tie the score with 12:37 left in the first period. Dahlin inches closer: With an assist on Reinhart's goal, Dahlin has 41 points in 75 games this season, trailing only Phil Housley (57 points in 1982-83) for the most by an NHL defenseman before his 19th birthday. Bucking the trend: Entering Sunday's games, the Sabres ranked 29th in second-period goals against (93) and 30th in second-period goal differential (minus-29). Yet, they were outstanding in the second 20 minutes against the Devils. Buffalo had more shots (14-5) and shot attempts (19-13), firing five shots on goal during a power play midway through the period. Jack Eichel and Alex Nylander nearly gave the Sabres the lead, only to have their attempts stopped by Schneider. Meanwhile, Ullmark had a strong second period, including his stop on Travis Zajac with 13 minutes remaining to help keep the score tied entering intermission. Since the start of the 2015-16 season, the Devils are 92-2-14 when leading after 40 minutes. Lineup: Defensemen Zach Bogosian (lower body) and Matt Hunwick (upper body) were unavailable because of injury, drawing Lawrence Pilut into the lineup. Additionally, Casey Mittelstadt was a healthy scratch and was replaced by Tage Thompson. Scott Wilson also was a healthy scratch. Next: The Sabres travel to Ottawa, where they will play the Senators (26-43-6) at 7 p.m. Tuesday night.